The 1998 movie "Armageddon" depicts two Space Shuttles launching simultaneously. I read some expert say that "There isn't enough computing power in the world to launch two shuttles at the same time". I always wondered if that was literally true. EDIT: I can't find the quote, but considering I heard it about twenty years ago, it's possible that I misunderstood. Maybe he meant "...enough computing power in one place in the world..." (I.e. NASA couldn't do it alone.) Or that he said "not enough...to operate [not just launch] two shuttle flights simultaneously". In any case, answers below confirm that launching two shuttles and managing their flights would be something NASA could have accomplished in 1998, computerwise. There are five consumers of computing power in the shuttle launch. The first is the simulation and testing. Which was processing intensive and at times a major consumer of processing power but a dual launch does not actually require dual simulation in real time. The unique profile needed for the movie mission quite possibly would need a world wide pooling of processing power to simulate lots of different profiles to find a best one, but once chosen verifying that flight would not be much more of a problem than two ordinary missions. The second is the actual flight control once it leaves the pad, which is carried by the orbiter and self sufficient all the way to orbit by design and multiply redundant and driven by vote. So there were multiple duplicates within each shuttle and across the fleet. The third is the launch control hardware which was in the pad itself. Answers seemed to vary with time about the processing here but was less computational and more signal conversion and sequencing. There were three of them. They conducted the final launch sequence autonomously with the monitoring hardware in launch control acting as a veto so once in a final countdown condition could complete it without needing more external processing power. The fourth is the actual launch management, which may be where this question started. While intended to support rapid launch sequencing and did support two simultaneous shuttles on the pad it is unclear if there is actually capability to have two simultaneous launches active. The problem here is not processing capacity but having enough interface hardware to monitor the final launch sequence so if it is 'we launch on time or we die' then this does not prevent a launch, just makes it higher risk since there will be fewer eyeballs watching events. The fifth and final consumer of processing was the ground based tracking and control loop. The launch tracking would not easily handle two simultaneous launches but that is more a restriction on tracking hardware numbers and telling the two launches apart. All of this is important for safety and investigating an accident but does not directly prevent a launch. Once in orbit the tracking process are already managing multiple objects anyway so not meaningfully different to have two shuttles up at once over one shuttle plus various satellites. There are several other reasons why a formation launch is awesome fiction but a problematic reality but global processing power is not one of them. The shuttle itself had five AP-101 computers. They were derived from the IBM System/360 architecture, but with 32-bit registers and a 1 Mb address space. Mission control did have many computers (including many mainframes) in Building 30 of Johnson Space Center in Houston. Launch control at Kennedy Space Center and the backup mission control in Huntsville also had computer facilities. Mission simulators had the same hardware as the spacecraft itself, with additional support computers. All of the above computers were at most mainframes; i.e. a shuttle mission did not rely on supercomputers. In contrast, consider NASA's Advanced Supercomputing Division at NASA Ames Research Center in Mountain View, California. By 1998, this division had over 20 supercomputers, far more than the entire computing power of the shuttle program. The division performs calculations for fluid dynamics, aircraft design, weather modeling, and ocean current prediction. They also have resources for data visualization and massive data storage. This is all for research, and isn't actually needed for a shuttle launch. 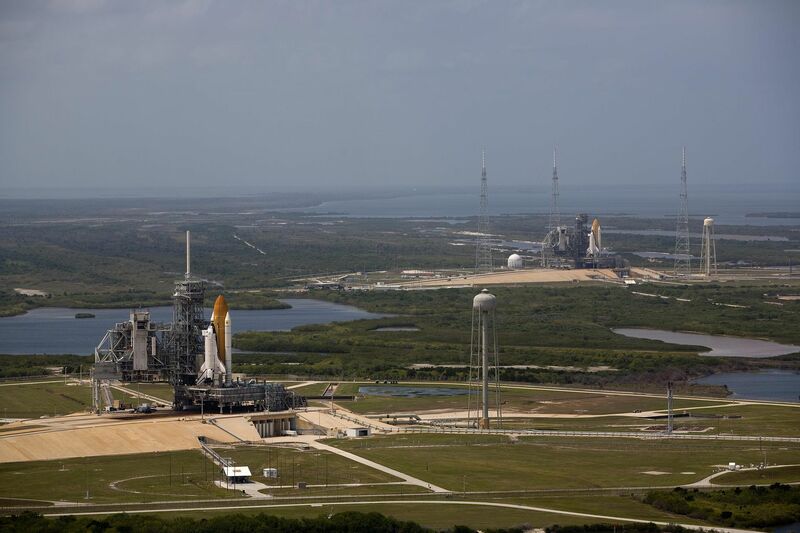 Finally, two shuttles (Atlantis and Endeavour) were on launch pads at the same time in 2008. Atlantis launched for the final servicing mission for the Hubble Space Telescope. Endeavour was made ready for a rescue mission if something went wrong with Atlantis. Fortunately, no emergency happened, and Endeavour launched on its own mission a few weeks after Atlantis landed. So it's quite possible to launch two shuttles at the same time. Throughout the duration of the Space Shuttle programme, the overwhelming majority of the world’s computers were busy with duties which had absolutely nothing to do with it. So launching one shuttle took far less than half the available computing power in the world, and launching two would also have taken far, far less than the available computing power in the world. Incidentally, although it doesn’t qualify as two simultaneous launches, I do believe NASA was prepared to launch a second shuttle while one was already in flight, in particular for rescue scenarios. This is a quite strange assumption. What superior computing power does a launch need? Most of what is done is in control systems. Maybe some supercomputer is required for a few minutes in mission planning ahead of time to calculate trajectory, but that's all. In 1970, US manufacturers alone shipped about 15,000 mainframes a year. By 1980, this number rose to more than 35,000 units. This number does not include any smaller systems like minis - and more importantly, it does not include any European or Japanese manufacturer. Even if the Shuttle needed a dozen high-end mainframes to be prepared for launch (which I doubt), that's just a droplet compared to the stream of systems installed at that time. Sure, NASA had some impressive machines, but not anything near than half the world's computing power. During Gemini, they actually had to support two spacecrafts in orbit at the same time, in order to test rendezvous. That involved not only two systems, but also sharing data between them. It seems unlikely that this dual redundancy would have been abandoned during Apollo or the Space Shuttle launches. That being the case, the necessary computer power could be made available by simply using one of the two systems to support each launch. You lose the redundancy, but that is all you lose. What I'm not seeing the answers here address is the tracking issue, which seems almost certainly part of what they are talking about. NASA tracks US satellites (and the shuttles when they were operational) with a couple of ground stations called TDRSS. These themselves use satellites, many of which were launched by Space Shuttle missions in the 1980's and '90s. I don't know a lot about the composition of the first TDRSS, but I worked on the system's software for the second TDRSS (STGT) from about 1989-92, so I know a bit about that system. It used a set (6ish if memory serves) of VAX clusters. Each cluster contained 2 full-blown VAX VMS mainframes, and a third small machine. One mainfraime in the cluster would be the master that was actually operating things, the other was a "hot" standby that was doing all the same work, but not transmitting, and the third's only purpose was to detect if the master crashed, and help promote the hot standby to master. Clusters themselves had hot spare clusters in case the whole cluster went down. The point of this story though is that this wasn't really run by that many computers. Low double digits of commercial VAX machines. While these weren't entry-level VAX machines, they weren't supercomputers either. DEC sold 400,000 Vaxes over the product line's history. Scraping together another 12ish of them at need in 1998 probably wouldn't be an insurmountable task. That being said, these stations were designed to track lots of space and near earth objects at once. I'm not a shuttle expert, but I don't see why adding one more of those would have broken the system. In fact, if Wikipedia is right, even with one shuttle and the ISS up there simultaneously, most of the bandwidth was still reserved for US military operations*. If the US (and not so incidentally the planet it is sitting on) were about to be destroyed, I highly suspect the US military would happily donate some of it. * - They provide a quote attributed to Space.com, but their reference link doesn't contain the quote. GremlinWrangler is correct that all processing happened on the ground at KSC up to launch, and then the Orbiter's on-board computers took over at liftoff. The Space Center had 4 "firing rooms" at the Launch Control Center (LCC). One of these four firing rooms was used for any given launch, and if you have ever seen video of the folks at console computers during a Space Shuttle launch, that is a firing room. Now at any given time, not necessarily all four firing rooms were available to control a launch (one was originally just a conference room, one was extensively remodeled in 2006), but there were always at least 2 or 3 firing rooms "in commission". Now, all of these computers (including the Orbiter's 5 computers, or "GPCs", and those in each Firing Room) were built in the 1970s, and in 1998 were still in place using 1970s technology! Each console in the firing room was, if I recall correctly, equipped with just 64 KB of RAM. By comparison, my desktop in 1998 had a few megabytes of RAM. All of the sensors from the pad and the shuttle were fed back into one Common Data Buffer in the firing room, which contained a whopping 128 KB (yes Kilobytes) of RAM (technically configured as 64 KB of 16-bit words). All this to say, it should be painfully obvious that a rocket, no matter how innovative or unique, designed and built in the 1970s, with a computerized launch system designed and built at the same time, was still ~25 year old technology by 1998. There's no way even a room full of these 16-bit 64K computers were even a fraction of the entire processing power available in the world in 1998. It is at least plausible. In theory it is certainly possible to launch 2 shuttles simultaneously. Additionally closed loop immediate guidance can be done by one typical p.c. Of that era. It isn't to different then what was done by the orbiter simulator which ran on a pc. In theory this could minimally operate two orbiters. However in reality, we don't know Nasa's requirements as far as accuracy and certainty in the orbits selected for the missions. It is certainly plausible that Nasa had a significant percentage of the world's computational power at that time (and still does), and that it did use it to plan missions already in progress. In such a case piloting 2 shuttles would require more resource then what was available to maintain the same level of calculation which was already put into a shuttle mission. How many units did the Victor 9000 sell?